Summary: We report the cases of two patients with influenza-associated encephalitis/encephalopathy (IAEE) who presented with mild CNS manifestations and complete recovery within a few days. Initial MR imaging at days 4 and 5 revealed a lesion in the central portion of the splenium of the corpus callosum with a reduced apparent diffusion coefficient (ADC) value, which completely resolved on follow-up studies at day 10. We postulate two possible mechanisms for decreased ADC; namely, intramyelinic edema and an inflammatory infiltrate. It is well known that influenza virus is associated with various CNS lesions that have poor prognoses, including Reye syndrome, acute necrotizing encephalopathy, and other types of influenza-associated encephalitis/encephalopathy (IAEE; 1–3). The pathogeneses of these lesions, however, is still uncertain, and it remains obscure whether influenza virus causes encephalitis or encephalopathy and why it occurs mainly in Japanese people. We report the cases of two patients with IAEE who presented with mild and transient CNS manifestations and with MR findings showing a reversible lesion in the central splenium of the corpus callosum with reduced apparent diffusion coefficient (ADC) values. We also review four other published cases of encephalitis/encephalopathy with a reversible central splenial lesion (4–7) and discuss the possible pathogenesis of this lesion. A previously healthy 7-year-old Japanese girl was admitted to our hospital with disorientation and hallucinations following a 1-day prodromal illness consisting of high fever (40.0°C), cough, and rhinorrhea. Before admission, she had received only acetaminophen as an antipyretic. On admission, she was drowsy, but her neurologic examination was unremarkable. Blood count and serum ammonia and glucose levels were normal and biochemical tests were negative, including glutamic-oxaloacetate transaminase and glutamic-pyruvic transaminase. CSF showed normal cell count (1/3 mm3), protein (9 mg/dL), and glucose (53 mg/dL). Electroencephalography showed normal basic activity with no paroxysmal discharges. Influenza A (H3) was later isolated from her throat swab, and the influenza genome was not detected by polymerase chain reaction (PCR) in her CSF sample. A diagnosis of IAEE was made, and she was treated with amantadine; her clinical manifestations gradually improved, and by day 3 she had completely recovered. MR imaging on day 4 revealed a lesion in the central splenium of the corpus callosum with slight hyperintensity on fast spin-echo T2-weighted images (Fig 1A; 4000/100 [TR/TE]) and isointensity on spin-echo T1-weighted images. Case 1. On day 4, fast spin-echo image (A: TR/TE = 4000/100), DWI (B: spin-echo EPI; TR = 5000; b = 1000), and ADC map (C: ADC = 0.485 × 10−3 mm2/s) show a lesion in the central splenium of the corpus callosum. This lesion had resolved on a fast spin-echo image, DWI (D), and ADC map obtained on day 10. Diffusion-weighted images (DWI) (Fig 1B, spin-echo EPI: TR, 5000; b = 1000) showed markedly high signal intensity, and ADC maps (Fig 1C) demonstrated decreased ADC value of the lesion (ADC = 0.485 × 10−3 mm2/s). No other lesion was recognized in the cortex and white matter. Follow-up study on day 10 (Fig 1D) showed resolution of the T2 and diffusion abnormality (ADC = 0.857 × 10−3 mm2/s). A previously healthy 11-year-old Japanese boy was admitted to our hospital with right-side-dominant paralysis following a 3-day prodromal illness that consisted of high fever, cough, and rhinorrhea. Before admission, he had received amantadine and acetaminophen for a clinical diagnosis of influenza. On admission (day 4), his neurologic examination revealed mild left-sided facial palsy and right-side-dominant paralysis. Blood count and serum ammonia and glucose levels were normal, and biochemical tests were negative, including glutamic-oxaloacetate transaminase and glutamic-pyruvic transaminase. CSF showed normal cell count (2/3 mm3), protein (18 mg/dL), and glucose (61 mg/dL). Electroencephalography showed normal basic activity with no paroxysmal discharge. Rapid antigen-detection assay and PCR from a nasopharyngeal swab revealed influenza B, allowing a diagnosis of IAEE, and therapy of oseltamivir phosphate was begun. The influenza genome was not detected by PCR in his CSF sample. His clinical condition improved rapidly, with complete recovery on the following day (day 5). MR imaging on day 5 revealed a lesion in the central splenium of the corpus callosum and symmetric lesions in the centrum semiovale, medial to the central sulci, with slight hyperintensity compared with surrounding white matter on fluid-attenuated inversion recovery images (Fig 2A) and isointensity on spin-echo T1-weighted images without contrast enhancement. DWI (Fig 2B and C) showed markedly high signal intensity, and the ADC maps (Fig 2D and E) demonstrated decreased ADC values of the lesions (ADC of the central splenium = 0.325 × 10−3 mm2/s). Follow-up study on day 10 (Fig 2F and G) showed resolution of the T2 and diffusion abnormalities (ADC of the central splenium = 0.776 × 10−3 mm2/s). Case 2. Fluid-attenuated inversion recovery (A), DWI (B and C), and ADC map (D and E: ADC of SCC = 0.325 × 10−3 mm2/s) show a lesion in the central splenium and symmetric lesions in the centrum semiovale adjacent to the deep central sulci on day 5. Follow-up fluid-attenuated inversion recovery, DWI (F and G), and ADC maps obtained on day 10 did not show the lesion. We present two cases of IAEE with transient reversible CNS manifestations and MR imaging findings revealing reversible foci of T2 prolongation and reduced diffusion in the central portion of the splenium of the corpus callosum. Recently, the number of patients with IAEE has increased in Japan, especially in children under the age of 5 years (1). The rates of mortality (31.8%) and disability (27.7%) are high (1). Therefore, the two cases reported here were relatively mild. The neuroradiologic findings in 30 patients with IAEE (2, 3) were previously divided into five categories: category 1, diffuse brain edema (two patients—both died); category 2, symmetric involvement of thalamus, brain stem, and cerebellum, so-called acute necrotizing encephalopathy (seven patients—four deaths, one with neurologic sequelae, and two with complete recovery); category 3, normal findings in the acute phase followed by the appearance of diffuse low attenuation and mild brain atrophy (10 patients—nine with neurologic sequelae and one with complete recovery); category 4, postinfectious focal encephalitis (two patients—both developed epilepsy); and category 5, no abnormal lesions (six patients—four with complete recovery and two with neurologic sequelae). Two patients in category 4 (3) presented with CNS manifestations more than 20 days after their influenza infection. Their CSF showed an increased cell count, and MR revealed lesions with contrast enhancement in the cortex and subcortical white matter, which suggests a diagnosis of acute disseminated encephalomyelitis (ADEM). MR imaging of the present two cases, reversible lesions with reduced diffusion in the corpus callosum and white matter, are distinct from those of categories 1–3 and 5. ADEM (category 4) should be considered as a differential diagnosis of acquired lesions in the splenium of the corpus callosum (8). ADEM is monophasic postinfectious or postvaccinial inflammatory disorder that is pathologically characterized by an acute perivenous lymphocytic inflammation with confluent demyelinatiion. ADEM presents with seizures, focal neurologic signs, and alteration of consciousness that develop days to weeks after the onset of presumed viral infections. CSF analysis reveals mild pleocytosis. Corticosteroids are accepted as useful in the treatment of ADEM, and recovery occurs within weeks (9). MR imaging usually shows T1 and T2 prolongations, typically bilateral and asymmetric, in the subcortical white matter (10). Although the corpus callosum may be involved in ADEM, these patients nearly always have asymmetric callosal lesions, and their white matter has lesions as well (8). After contrast material infusion, the lesions in ADEM will show various patterns of enhancement, depending on their acuity. Improvement of white matter lesions may take a long time, and part of the white matter damage may be permanent. The two patients in this report developed symptoms soon after the onset of influenza (days 1 and 4) and also quickly recovered completely without corticosteroids (days 3 and 5). CSF analysis revealed normal cell count. MR lesions were located centrally or bilaterally and symmetrically, had no contrast enhancement, and recovered completely within a week after the onset of CNS manifestations. The central splenial lesions in the two cases are, therefore, unlikely to be manifestations of ADEM. Other differential diagnoses of the lesion in the splenium of the corpus callosum—including ischemia, posterior reversible encephalopathy syndrome (increased ADC value), diffuse axonal injury, multiple sclerosis, hydrocephalus, Marchiafava-Bignami disease, and lymphoma (8)—are excluded clinically and neuroradiologically. We postulate two possible mechanisms for decreased ADC in the two patients: intramyelinic edema and inflammatory infiltrate. Recently, high signal intensity on DWI and decreased ADC values of white matter lesions have been observed in patients with Canavan disease, metachromatic leukodystrophy, and phenylketonuria (11, 12). A possible explanation for this is intramyelinic edema as a result of separation of myelin layers (11, 12). Of note, periventricular T2 abnormalities in phenylketonuria have been shown to be reversible with improvement in metabolic control (12–14). Therefore, the transiently decreased ADC values in the present patients suggest that reversible intramyelinic edema may be the operant factor. A DWI study of MS found decreased ADC values in four of 28 homogeneously enhancing MS lesions (15). The authors postulated that the influx of inflammatory cells and macromolecules and related cytotoxic edema might have caused decreased ADC. If inflammation had occurred in our two patients, decreased ADC could be found. In either case, ADC may return to normal within a week if the intramyelinic edema or inflammatory infiltrate resolves quickly. We also speculate that elevated inflammatory cytokines, such as interleukin-6 (1, 2), may play an important role in the pathogenesis. 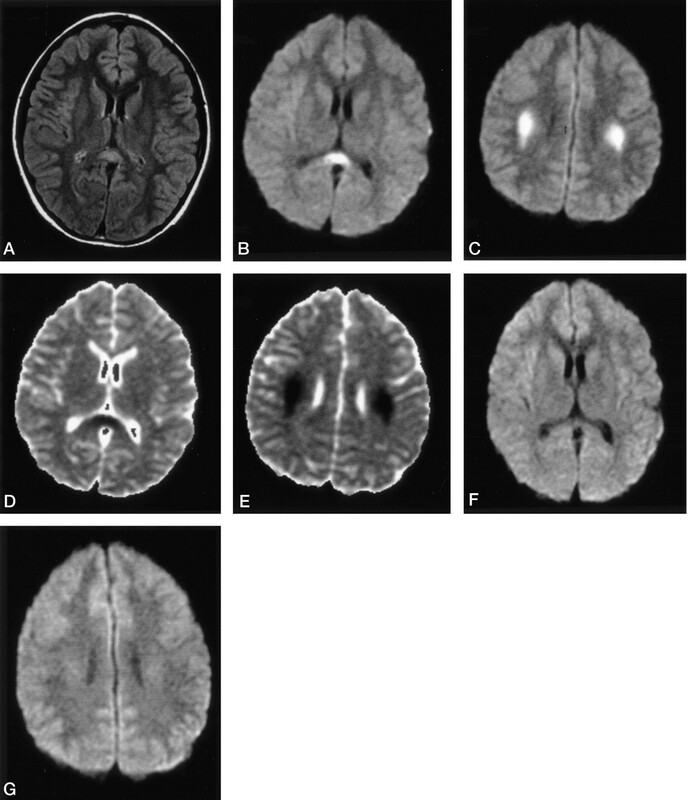 A review of the literature reveals that similar MR findings in the central splenium of the corpus callosum have been reported in some cases of infectious encephalitis/encephalopathy other than IAEE, such as rotavirus (4), O-157 Escherichia coli (5), measles virus (6), and Salmonella enteritidis (7). Despite different causative agents (viral or bacterial), the clinical manifestations and MR findings were nearly identical to the present two cases. The four previously reported cases presented with relatively mild CNS manifestations and complete recovery occurred within a week without administration of corticosteroids. CSF study performed in two of the four cases showed normal cell count, glucose, and protein. Although posterior reversible encephalopathy syndrome was clinically suspected in one previous case (5), the callosal lesion in the syndrome is usually seen as part of more widespread white and gray matter lesions that have increased ADC values. DWI performed in three of the four cases during the acute phase (4, 6, 7) revealed, as did our cases, homogeneously reduced ADC values, which normalized within 2 weeks. One case (7) additionally had symmetric white matter lesions that were similar to our case 2, located in the centrum semiovale subjacent to the central sulci with decreased ADC value. The pathogenesis of the reported cases was postulated to be direct viral invasion leading to cell damage (4) or verotoxin binding causing axonal damage (5) that could not be applied to all the cases. Although the splenium is the only region where the vertebobasilar system intervenes in the vascularization of the corpus callosum, which is primarily supplied by the carotid system (16), the absence of any other lesions in vascular distributions makes it unlikely that the splenial lesions have vascular causes. It is interesting to note that both of our patients had recovered clinically by the time the lesions were detected by MR imaging. We have no good explanation for this, although we might speculate that the ADC was in the process of normalizing by the time the MR imaging examinations were performed, and therefore, the physiologic processes in the affected cells were recovering. Another explanation might be that more foci of abnormal T2 signal intensity and abnormal ADC were initially present in our patients and were responsible for the clinical manifestations. Those areas would have recovered completely by the time of the MR imaging, and therefore, would not have been visible. It is unclear how common this finding might be in children with mild encephalopathy secondary to infection. 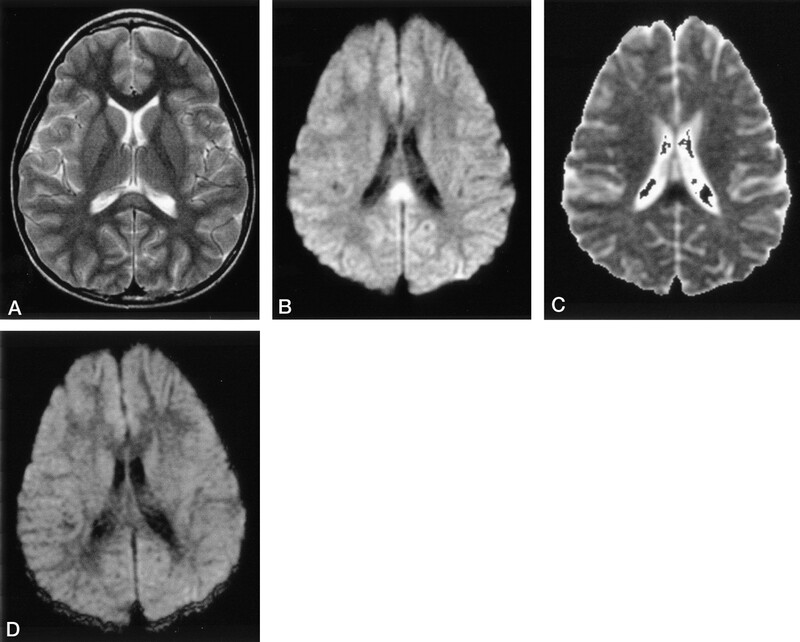 Because of the relatively high incidence of IAEE in Japan, we have obtained brain MR images in children with relatively mild CNS symptoms; MR imaging studies are not commonly obtained in such patients, making it difficult to know how often the splenial abnormalities might be seen in this patient population. Whatever the incidence and cause, to avoid unnecessary invasive diagnostic and therapeutic intervention, it is important for clinicians to recognize that clinically mild encephalitis/encephalopathy can occur in conjunction with a reversible central splenial lesion after systemic viral or bacterial infection. We thank patients and families for their contribution to this study. We appreciate the medical assistance of Drs. H. Suzuki, N. Saeki, K. Fujii, N. Ishiwada, and M. Endo and the excellent technical support of Misters F. Morita, Y. Nakano, and S. Ochi and Ms. T. Isobe, of the Chiba University Hospital. Accepted after revision July 9, 2003. Widening spectrum of a reversible splenial lesion with transiently reduced diffusion.